It’s not unheard of to see media members carry water for the sports league they cover. We’ve certainly seen plenty of NFL pundits talk about the “right way to play” and defend the league against outspoken players who don’t tow the company line. We know there are lots of MLB writers out there who have a specific idea in their mind of what a baseball player is supposed to do and how they should conduct themselves (some of them decide who gets into the Hall of Fame). So it’s not a surprise that the 2019 Final Four has brought out the hot takes regarding the lack of one-and-done stars among the last four teams standing. It is a bit much, however, just how much all of these folks want to help the NCAA make the case that college basketball players should be ashamed for wanting to pursue their dreams. As you’re well aware, the Duke Blue Devils and their line-up of likely one-and-done superstars was ousted in the Elite Eight by the Michigan State Spartans. 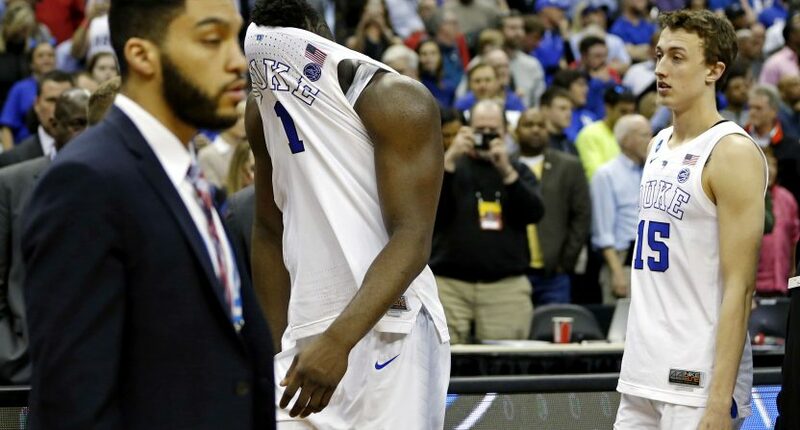 There was much schadenfreude in general given that we’re talking about Duke, but there was also a lot laid at the feet of players like Zion Williamson, R.J. Barrett, and Cam Reddish, all of whom are expected to leave for the NBA Draft and be top-ten picks. While there’s certainly a debate to be had over why Coach K was unable to win with so much talent, the conversation instead seems to have veered towards an indictment of the one-and-done model itself. Of course, what this invariably does is put the blame on the student-athletes, who basically have no choice but to play college basketball for a season before being allowed to go to the NBA (though that is likely going to change soon). They’re labeled as me-first players who put their own needs over that of the team, which, to be fair, they should absolutely be doing considering how much the NCAA model is actively working against them from a financial perspective. So when writers and pundits are tripping over one another this week to claim victory over the one-and-done model, what their really doing is chastising players like Zion Williamson for ruining the integrity of the sport. That college basketball is and always was a team sport defined by the ability of five selfless individuals to put aside their egos for the greater good. It’s the “right way to play the game.” And what John Calipari and Mike Krzyzewski have wrought by buying into the one-and-done recruits has besmirched everything their predecessors accomplished. And we should all bow our heads in thanks to upstanding people like Tom Izzo, Chris Beard, and *checks notes* Bruce Pearl for carrying high the sanctity of college basketball. Over at The Big Lead, they noted that “it’s become increasingly clear that leaning heavily on one-and-done players isn’t the way to win a college basketball national title.” Ironically, that statement is followed up by mentions that 2018 Villanova, 2017 North Carolina, and 2015 Duke all had one-and-done players on their championship roster (whether those guys intended to only play one season or not). CBS Sports noted the trend. The LA Times called it out as well. The Washington Post is giddy over the revelation. Dan Wolken at USA Today also echoed the sentiment, though noting that plenty of teams have won with one-and-done stars (Syracuse in 2003, Kentucky in 2012) or at least made it to the finals (Memphis in 2008) and (Kentucky in 2014). In fact, the more people list out teams that had one-and-dones in the championship game, the more it makes you realize that we’ve always had one-and-done talent in the Final Four, we just didn’t have a one-and-done rule. Think of all the great teams of the 1990s who played for championships (UNLV, Duke, Arkansas, Michigan) and imagine how many of those players would have gone pro after one season had they been able. Most of The Fab Five was gone after two years anyway, of course they would have left as freshmen. One-and-done is just a label. The same talents have been entering and leaving college basketball’s revolving doors as quickly as they can for years. There’s really nothing new about what’s going on with college basketball. Sometimes the team with the transcendent star wins (Georgetown with Patrick Ewing, Kansas with Danny Manning, Michigan State with Mateen Cleaves). Sometimes the team with a core group of upperclassmen wins (Kentucky in 1998, Maryland in 2002). Sometimes it’s a weird mix. Every year is different, so it’s a fool’s errand to look at this specific year’s Final Four and declare that we’ve solved the puzzle and one-and-dones are the incorrect answer. Besides, if Duke hits one free throw, we’re probably not even having this conversation right now. It’s less about “what it all means” and more about how a missed shot here and there changes legacies forever. Anyone who has covered sports for even a short amount of time should know that. Things will change. We have no idea what the 2020 Final Four will look like, but if the winning team has a superstar who leaves after one or two seasons, will that cause everyone to shift their take to fit that narrative? Or will that just get chalked up to being a fluke to fit this one? The truth is, there is no one right answer on how to win in college basketball. Every season is its own organic system, feeding on what happens to float by that year. It depends on the coaches. It depends on the players. And it depends on dumb luck. Guys good enough to play only one season in college basketball aren’t the bad guys. They may or may not be the answer either, but this idea that you have to have a team of “five gritty seniors who do what their told” says more about your norms than it does about the state of the game.